In 1941, Arthur Mee visited Bradwell for his book The King's England. At the time, this was still a tiny, isolated Suffolk village deep in the wilds of the Lothingland peninsula. Looking down on this quiet, gracious countryside is a small round tower hardly changed since the Norman buiilders left it, he wrote. Lothingland is defined by the River Waveney, and by the marshes which sprawl along the line where the two great counties melt into each other. Today, Bradwell is in Norfolk. More dramatically, the parish is home to some ten thousand souls, and is deeply imbedded within the dismal suburbia of Great Yarmouth. What changes anyone who has lived here throughout those times must have seen! The border was moved in 1974, but even before this the huge housing estates were growing up in great swathes around this church. Because of its setting in this heartland of locked churches, we knew that St Nicholas would also be locked. But as we came through the anonymous estate the road suddenly changed, and you could get a glimpse of how it might once have been, the old trees, the village inn, the cottages - and there, at the entrance to the graveyard, was a large sign: Church Open. St Nicholas is a substantial church in a wide graveyard, and must have been quite imposing when it was surrounded by fields. The trees that knew those times still shroud it sadly, and it was like being somewhere long ago: one hung its boughs over a large memorial to the family of a former rector, and a robin watched us quizzically from a lichened headstone. Walking around to the north side, however, we saw a large modern extension built on to the former north doorway. Such things are relatively common, and this one works quite well, if a little stiff and over-polite. It is certainly an improvement on the one at Belton, a couple of miles off. We went inside. "Oh!" said a surprised voice as I pushed the door wide open, and then "Hello!". I looked around, and for a moment there was nobody: but then I turned, to see two old ladies sitting behind the doorway. The one who had greeted us smiled sweetly; the other sat a little more sternly, perhaps suspicious of the motives of two men in the middle of the day wandering into a church. "Can we look around?" I asked. "Of course", said the smiling one. I explained that we were really pleased, and perhaps a little surprised, to find the church open. It turned out that they have recently started opening it every Wednesday afternoon, on the off-chance, perhaps in response to the Bishop of Norwich's plea for all the churches in the Diocese to be open to strangers and pilgrims. "Do you get many visitors?" I asked. The two ladies looked at each other. "No, you're the first!" laughed our cheerful host. Her companion watched us warily as we examined the font, which is particularly characterful, and not a little interesting: for example, it bears clear signs of attempted iconoclasm. On one of the faces, a chunk of metal was imbedded in the winged lion of St Mark. I assume that it is the head of an axe or pick which has broken off. It probably dates from the 17th century. Puritan attacks on fonts of this kind are familiar in the area south of Bury St Edmunds, but it was the first time I had seen it up here. Paradoxically, it generally occured in churches where the Anglican reformers of a century earlier had not been enthusiastic enough in effacing or disguising imagery. 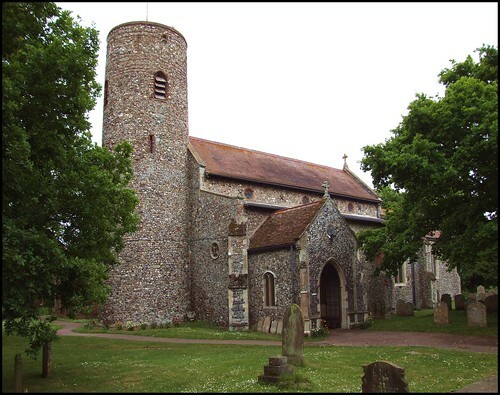 Bradwell church is substantially restored, and bears a huge imprint of the late 19th century. Cautley could find little to say about it. And yet, it is atmospheric and of interest. Perhaps this is a result of not being well-known, and rarely visited (although not as rarely visited as Belton). Perhaps the most interesting feature is a window on the south side. It dates from the 1930s, but looks older. It is a memorial to John and Christine Fellows, a brother and sister who ran a shipbuilding business on Southtown Road in Yarmouth. They provided the ships used by William Grenfell on his expeditions to Labrador in what is now Canada. Grenfell was an evangelical doctor, a medical missionary, who was well known in late-Victorian England, and accorded hero status. His expeditions to look after, and convert, the fishermen of Labrador, who he refered to as 'English-speaking people of our own race', were as avidly followed in the press as the adventures of Cecil Rhodes. Grenfell lived to a ripe old age, and did not die until 1940. It's curious to see a memorial to two people with imagery from the life of someone else. Bradwellians of an earlier time are remembered up in the chancel. This is the memorial to William Vesey, who died in 1644. Again, it looks the work of half a century earlier. Improbably, it was brightly coloured by the hands of two local art students in the 1960s, and the blue and white of the framing creates an unfortunate wedding cake effect. Below the Vesey memorial are unusual communion rails. They depict sea monsters and cherubs, an unlikely thing to find in a church. They may originally have been stair banisters or balcony rails, from some great country house when it was rebuilt in the Victorian period, quite possibly Somerleyton Hall. They seem to date from the late 17th or possibly 18th century. Wandering around, I increasingly felt a sense of being in a church which was once very busy, but which today finds itself slightly beached as the tide of Anglicanism has retreated. The 19th century restoration left it with an urban feel, so it is with some irony that the growth of Yarmouth has stifled the rural nature of its parish, leaving the church beleaguered. And yet, the interior has a certain gravitas which is missing from many of the churches around here. We said our goodbyes to the two custodians. We'd obviously given them something to talk about. Stewarded churches are unusual, and it was nice that their efforts, although unnecessary, had not been in vain. I had also enjoyed remembering something I had read a few days earlier in the returns for the 1851 Census of Religious Worship. On Sunday 30th March 1851, every religious minister in England and Wales was required by law to make a return detailing how many people had attended his services that day. Most did this, although many pointed out that the inclement weather that morning had reduced their numbers. However, William Trivett, the rector of Bradwell, would have no such truck. He drew a line through the form, and overwrote it: Being employed in spiritual duties of my office, as minister of Gospel of Jesus Christ, I have no means of counting congregation attending morning and evening service. Trivett was Rector of Bradwell for more than half a century. His memorial is in the chancel.